Hi-Speed SDChassis Assembly Platform | Steven Douglas Corp. The SDChassis is a world-class, high-speed assembly platform with extremely flexible tooling options and table arrangements. It creates synchronized motion for all common automation processes.Heavy, rugged, pre-engineered base provides smooth, high-speed, electro-synchronous, CAM derived motions (machine speed can be adjusted, and all stations stay synchronized). Pre-engineered pick-and-place motion modules provide a smooth, high-speed pick-and-place method with motion generated by the reciprocating hubs of the SDChassis. Each pick-and-place module is custom tooled to handle a specific part, i.e. : pneumatic gripper, suction cup, etc. 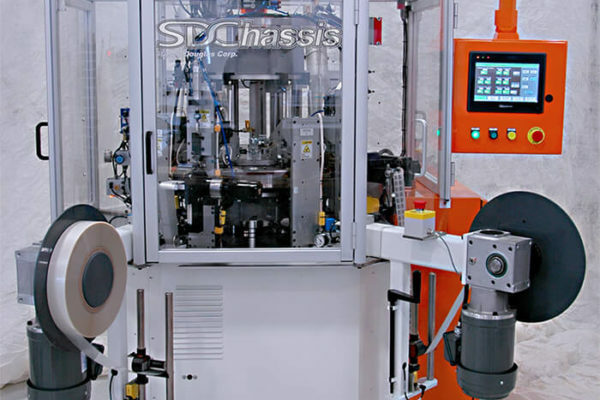 The SDChassis combines accurate and smooth tooling motions from its large CAM, along with the flexibility and programmability of a servo-driven indexing table and plate CAM encoder. The servo-driven indexing table allows for parts fixturing ranging from 4 to 48 stations, and the synchronized Servo CAM drives reciprocating plates that provide the motion for the tooling. Two upper and one lower reciprocating hubs are driven by three independent telescoping center shafts that each travel on independent CAM tracks. As the CAM turns, it generates independent vertical motion for each hub. The hubs include precision linear bearing and ride-on precision ground shafts. 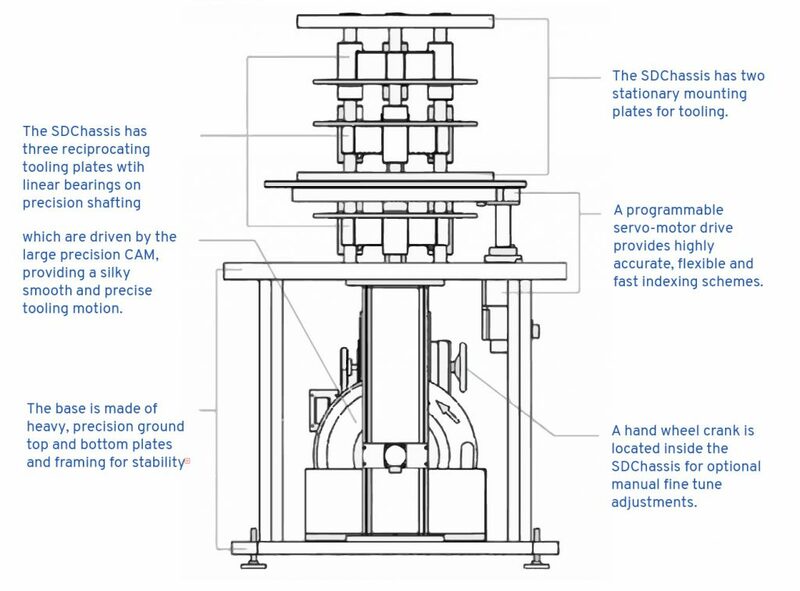 The vertical reciprocating hub motion is then available for SDChassis motion tooling. Pre-engineered probe/verify modules provide a smooth vertical or horizontal motion generated by the reciprocating hubs of the SDChassis. Each module is tooled with a probe containing soft springs for gentle part contact, while electric sensors, such as an optical sensor, provide a rugged yet precise method for verifying both part presence and position. Servo-driven indexing dial with a high degree of positional repeatability offers table fixtures custom tooled specifically for your parts. An encoder is used to electronically synchronize the indexing motion to the main SDChassis CAM and a shot-pin is engaged at every dwell to ensure positional accuracy. Pre-engineered motion and head tracking software is integrated with the PLC control system. With a fast and flexible small part assembly and processing machine center, a custom-tooled SDChassis is the perfect solution for any machine that requires high-speed, small-part assembly or processing and pick-and-place and probing actions. With over 16 years of production the SDChassis machine platform has proven to be one of the most robust and cost-effective choice compared to similar fully customized options. We have a library of pre-engineered motion modules for the SDChassis, allowing users to achieve virtually any assembly operation, including pick-and-place, light press, vertical and horizontal slides, probing, escapement, and many other motions. Additionally, standard tooling can be customized, or new tooling can be designed and built for your specific application. SDC’s expertise in designing custom parts fixtures specifically for the SDChassis allows us to offer fixtures for virtually any part. At SDC we specialize in custom engineering and design, we’ll work with you on every SDChassis to deliver a complete custom assembly and/or processing machine. 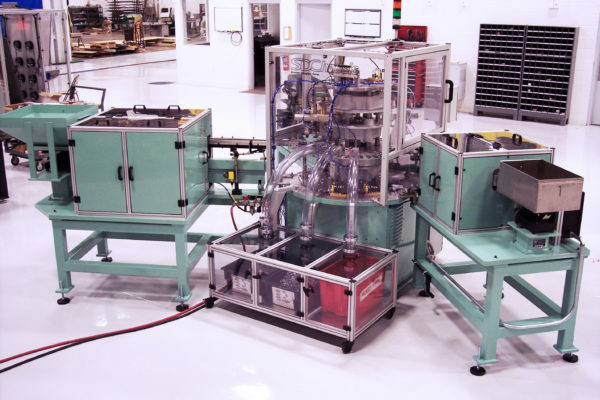 This fully automated machine was custom designed and built by SDC to create food grade container lids. This automated bolt-washer assembly and palletizing machine was custom designed and built by SDC and features our proprietary SDChassis, a conveyor, and SCARA robot. 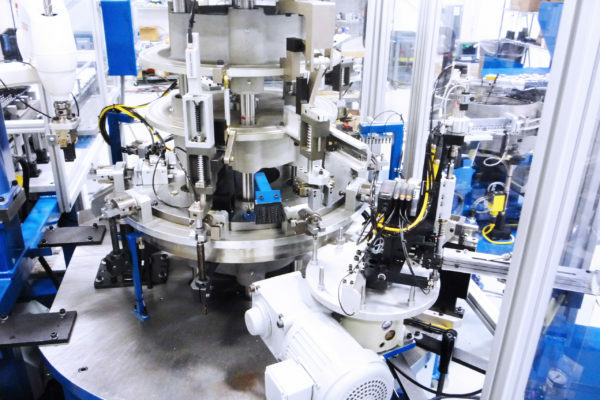 SDC developed a custom, fully automated high-speed system to produce automotive electrical connectors for a global supplier.